PRINCE EDWARD ISLAND lies cradled in the curving shores of Cape Breton, the north side of Nova Scotia and the southeastern part of New Brunswick. Although it is the smallest province of Canada it is one of the most scenic. In from the sea the gently rolling landscape is renowned for its pastoral beauty: neat green fields contrast with fallow red soils and tidily laid out woods and lines of trees. It is a gentle country and it gently meets the sea on all sides. The waves of the Gulf of St. Lawrence have evened out the irregular lines of the Island’s north shore by building long sandy beaches and bars across the headlands and the mouths of bays. And it is these beautiful beaches—some 25 miles of them—that have been set aside as Prince Edward Island National Park. 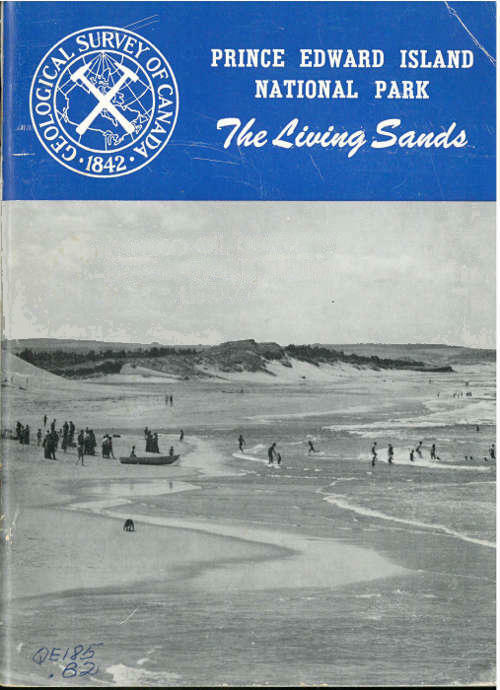 This booklet will tell you some of the geological history that led to the formation of the scenery and will point out some of the things of geological interest going on now. Beauty and enjoyment are greater for the man who understands. The low-lying land mass of Prince Edward Island is an extension of a lowland that covers a large area in New Brunswick and Nova Scotia. This extensive flat area has been developed on rocks about 250 million years old. In fairly recent times streams have cut shallow valleys into the old flat surface, and this gives the country its rolling, undulating appearance. It would seem from a study of the coastal areas that the streams were at one time able to cut a little more deeply into the country than they can now, for the valleys continue out under the salt water for some distance. This is another way of saying that the land seems to be flooded by the sea so that what were once river valleys are now estuaries. Waves and currents along the shores have made profound changes in the shape of the flooded shoreline of Prince Edward Island. Promontories and points have been worn off by wave-erosion. The water offshore is shallow everywhere, the bottom has been scoured by the waves, and sediments have been picked up and moved forward to the line of breakers. This material, combined with the products of erosion of the headlands and points, has been piled along the shore in long lines to form bars and spits. Because most of the materials available to the waves in the region of what is now the Prince Edward Island National Park are of sand size, the resulting deposits have formed magnificent beaches. As you stand on any of the beaches of the Park and look out to sea, the seemingly limitless water extends off to the horizon. From where you stand there seems to be no way of telling whether the water at the horizon is a mile deep or only a few feet deep. Yet the man who knows shorelines can tell you immediately that very likely the water is shallow for a long way out from the shore. A marine chart of the area would show that all along this section of the coast the water is still only 50 feet deep at a distance of 10 miles from shore. This is only a drop of one foot in a thousand—in other words, the bottom and the top of the sea are nearly perfectly parallel. Two very important results follow from this relationship between the sea and the land. The first has to do with what happens if the sea-level changes, and the second is concerned with what goes on at the shoreline itself. In a coastal region with a very gentle slope, very small changes in the level of the sea would make very great changes in the shape and position of the shoreline. By contrast, changes of sea-level at a place where the land meets the sea in a vertical cliff would not cause the position of the shoreline to move in or out, but only up or down. You can easily see the difference between what happens when the sea-level changes on a shallow, shelving shoreline and what happens when it changes on a steeper shore area by going to different parts of the Bay of Fundy; there the daily tides reproduce the effect exactly. At Fundy National Park, for example,  you may notice that where the bottom is flat, such as around the village of Alma, the water at low tide is nearly half a mile away from the dock area, but along the steep coast beyond Herring Cove, the shoreline at low tide is displaced only a few tens of feet, and the seaweed is left dripping on the steep cliffs above. Now what has this to do with Prince Edward Island National Park? If you look at any map of Prince Edward Island you will see that everywhere along its coast there are estuaries that look exactly like what they are—flooded river valleys. Because the country was very flat and the river valleys were very gently rounded, the flooding went back into them a long way so that most of the estuaries penetrate deeply into the land. Indeed in one place near Summerside, the Island is nearly cut in two where two of these flooded valleys happen to be opposite one another. Here on the north side of the Island lies Malpeque Bay, famous for its oysters. It is odd to think that this marine fishery is now on a site that was once a wooded lowland with a network of small brooks and rivers. In the region of the National Park itself these drowned river valleys are very well developed though not very large. Rustico Harbour, Rustico Bay, and Brackley Bay are examples. One can see in each of them the outlines of the main river valley flooded back for several miles with the river still entering the inland end of the valley. Tributaries are all flooded, with the heads of the brooks still flowing down the valleys and into the ends of the branch estuaries. Sandy red siltstone and sandstone form the coastline west of North Rustico. The thin layering parallels the ancient surface on which these sedimentary materials were laid down some 250 million years ago. The rocks are broken by vertical fractures or joints which can be seen trending diagonally across the picture. The second effect of the shallow shelving shorelines has to do with the behaviour of waves and wave-erosion. Everyone who has been to the lakeshore or seaside has seen the waves breaking along the shore and stirring up the mud and sand. Waves affect the bottom farther out too. Great storm-waves are known to agitate the bottom to depths as great as 400 feet, strongly enough to move fine sand and mud particles. In water as shallow as 20 or 30 feet their force is strong enough to actively erode the bottom materials and move them about. Part of the stirred-up sedimentary material is moved seaward toward the deeper water and part of it is moved forward to the line of breakers by the forward motion of the waves themselves. During a storm, when great winds pile up the waves against the shore, sand and silt picked up from the ocean bottom may be built into long ridges parallel to the shore. These become bars and spits and often are built up several feet above the ordinary level of the ocean. They are commonly strung out along the coast parallel to the general outlines rather than following all the intricate details of bays and headlands. This tends to smooth out coastlines. And this is what has happened on Prince Edward Island’s north shore where the National Park is situated. Where did all the sand come from? Marine charts show that for 20 miles off the shore of the Park the sea bottom is sandy. It is from the scouring and dredging of these sands by the waves, and their shoreward movement, that much of the present sand along the beaches has come. Two other sources, however,  have added their shares. One is the mantle of glacial deposits that covers the surface of Prince Edward Island and the other is the bedrock that juts out into the sea in a few places. All of Canada and much of the northern United States was covered by a vast ice-cap in geologically recent time. This was the great Ice Age when the climate of the world became much cooler. Snow stayed on the ground all year round and gradually accumulated to depths of hundreds of feet. Under the snowy surface of the great white waste the weight of the overlying snows recrystallized the bottom parts to form a sheet of solid ice. As the accumulation continued the mass of ice flowed slowly out over the country, pushed by its own weight. Thus the northern regions of North America were covered with moving glacial ice in the same way that Antarctica and Greenland are covered today. Soils were scraped away, pieces of the bedrock were scuffed up and transported in the direction of movement of the ice-mass, and, when the ice melted, masses of debris were left scattered over the landscape. When the cover of moving ice left Prince Edward Island, the droppings of the glaciers remained to form much of the surface of the land as it is today. Most of the debris is material that has not travelled very far, for it resembles the bedrock beneath. The rich soils derived from the glacial cover have made this province “the Garden of the Gulf”. The ice that covered the Island came from different places. At one stage it came largely from New Brunswick and the highland country to the northwest, while at another stage it seems to have come partly from the nearby highlands of Cape Breton. We can tell this by tracing the fragments of rock in the glacial deposits to areas where those kinds of rocks are still found in place. The glacial deposits over most of the Island are reddish sandy clays mixed with pebbles and boulders of sandstone and conglomerate. The bedrock below is soft and easily broken so that the passing ice ploughed up great quantities of it. Since the weathering of the resulting mixture was fairly rapid, the soils of the Island are excellent for agriculture and are especially suitable for growing root crops which demand airy, sandy soils. The red colour is from the stain of iron oxide which was in the original bedrock. All of Prince Edward Island is underlain by red beds—sandstone, and siltstone with some conglomerate and some shale. These rocks were at one time sand, silt, gravel and mud respectively. They seem to have accumulated in estuaries and on shallow marine benches at a period of time which is placed at about 250 million years ago and called ‘the Permo-Carboniferous’. Since that remote time the area has lain undisturbed as a lowland. Deep beneath the red rocks, which we nowadays find on the surface of the Island, there is evidence of other  events which are even older that 250 million years. A few years ago, very deep holes were drilled in Charlottetown Harbour and at a couple of other places. These holes went through a thickness of 10,000 feet of the red beds we have just described, into another set of rocks. The deeply buried rocks show that ancient seas, which were once spread over the area, had partly dried up in some places to make beds of gypsum and salt. The information from the drilling further shows that these old rocks were folded and broken before the younger red beds were spread over them. Although we have no direct record we know that still older events are recorded beneath our feet. Thus, thousands and thousands of feet below us there lies an enormous thickness of rocks that record a story of the earth’s history from its very beginning, 4 to 5 billion years ago. But let’s go back to the surface for another look at the red rocks there and see how they are important in the National Park. In the Park itself we see very little of the rocky framework of Prince Edward Island. It does stick out, however, between Rustico and Cavendish, where it forms the coastline for a few miles. Here we can walk over the rocks and see what they consist of. The first thing we may note about the rocks is that they are composed mostly of small grains of sand coated with a thin layer of reddish iron oxide. These sand grains are set in a matrix of even finer particles of silt and mud, bits and  pieces of white mica and greyish clay material. The sandstones are sedimentary rocks, and any sedimentary rock is really a monument to the destruction of some other rocks somewhere else, for the grains of sand you see here have come from the tearing down of rocks elsewhere. In some places you can find layers of small pebbles in these rocks. These are due to slightly swifter currents which were able to move larger fragments. You will note that all the pebbles are very well rounded. This generally indicates that they have been carried quite a long way in running water. During this transportation the edges and corners have been knocked off or ground off. Sometimes, by studying the pebbles in such layers, geologists are able to tell a great deal about the kind of rock that was being torn away and the kind of terrain it came from. The layers which are visible in the rocks result from the way the sediments were laid down long ago. Sands and silts were being spread out on the deltas of rivers or in shallow marine areas near shore. As each storm or each flood brought in surges of water, new layers of sand and silt or even pebbles were laid down. During quieter times, finer particles were added to the accumulating sediments; then the next interruption in the process brought the next change in the kind of deposit, producing still more layers. Erosion of the cliffs of sedimentary rocks and the overlying blanket of glacial till produces reddish pebbles and sands nearby. Here, the sorting action of the waves has produced zones of different composition parallel to the waterline. The layering in the rocks on the north shore of Prince Edward Island is very nearly flat, which shows that these rocks have not been disturbed by the great forces in the outer part of the earth which have so folded and twisted the rocks in many other parts of the Maritime Provinces. Some layers, small in area, can be seen to dip at 20 degrees or so away from the horizon. These are only local variations due to currents pushing  sediment over the edge of growing deltas or perhaps even to local scouring and filling at the time of origin. Something else you may note about the layering is the way flat pieces of debris lie parallel to the bedding or layering. If the rock were being laid down in water, then flat particles would be expected to lie flat rather than to stand on edge. If you will look at the rocks along the shore you will see over and over again that this is the case—flat fragments of shiny white mica or flattened pebbles lie along the bedding planes or layering. One has only to go to the seashore now and watch the waves moving the sand grains to see how this is brought about. The rock is conspicuously broken by parallel splits, which are more or less vertical, in several places along the shore. These are best observed about a mile north of Rustico breakwater. The breaks or joints in the rock are little more than hairline fractures but they are open enough to allow a little water to trickle down into the rock. In some of these joints small amounts of whitish mineral material, commonly lime or calcium carbonate, are deposited by such trickling water, and it becomes clearly visible when the joints are laid bare by erosion. All over the world, waves gradually wear away rocky coasts. They do this by dissolving the materials that cement the particles together, by grinding loose grains of sand and pebbles against the solid rock, and by the sheer pressure of the moving water itself. Areas where the rock is slightly softer or less resistant are worn away faster. On one part of the shore the rocks may have more joints, another part may be made of more porous or less tightly cemented rock, or perhaps there may be slight variations in the relative amounts of mud, sand or silt—any of these can make a difference in the resistance to erosion. The red rocks that underlie all of Prince Edward Island have been eroded by streams, waves and ancient glaciers to produce the soils, the overburden of clay, sand and gravel, and the sands on the beaches. Here, just east of the end of Cavendish Beach, erosion has left a sea stack standing alone offshore and irregular cliffs of rock. The overburden of glacial debris can be seen on top of the rocks of the point, as can the thin dark line of the soil and grassy vegetation on the very top. Rocky coasts are often undercut by the waves to produce overhanging cliffs. If the water eats into the rock on each side of a point, a hole may be cut right through, so that a tunnel or archway is formed. It frequently happens that as the shoreline recedes, erosion leaves behind small isolated remnants of former cliffs. These become small islands or stacks, like the one just east of the east end of Cavendish Beach. The shoreline has been defined as the boundary between the water and the land. How dull and lifeless this definition is in relation to what is to be seen and felt where the land ends and the ocean begins. For here, at the shore and along the cliffs, we see the struggle between the forces of erosion and the forces of resistance and construction—one seeking to tear down the land and the other trying to stop the onslaught of the waves and currents and to build up the land. Here is the place of supreme peace and calm when the elements are at rest, and the place of wildly raging surf and fierce winds in times of storm. In the waters near the  shore we find the birthplace of millions of marine creatures and, on the strand line, the shattered shells and carcasses of animals which nature has discarded. The beach is that part of the land that is covered with water-worn sand and pebbles, extending in most places from low-water mark to high-water mark, and a little beyond. It is a place of constant change—of sorting and mixing, cutting and filling, grinding and rounding. Even on a calm summer day the lapping of the small waves on the beach tells us of some activity there. In Prince Edward Island National Park we have a little of all these things, and we can watch many interesting processes in action. Let us look carefully at the sand on the beach to see what it is made of before we see how it is distributed and what forms it takes. Pick up a handful of sand on any beach in the Park and look at it very closely. What we are doing is leaving the world on our scale, where objects are measured in inches and feet, and moving in for a closer look at a world where things are very much smaller; grains of sand are measured in hundredths of inches, and the rare pebbles which are half an inch in diameter are large objects. A pinch of sand from somewhere on the beach where it is dry, spread onto a piece of dark paper or cloth so that the grains are separated a little, will show you many interesting things. Even with the naked eye you will be able to see that the grains are all about the same size. You may see that some are angular and some are rounded. Some grains  are clear and glassy, some are pink or red, and others are black. On some parts of the beach tiny flakes of a shiny white mineral are visible. The mineral quartz is by far the most abundant of all minerals in sand. In the Prince Edward Island sands most of the quartz is the clear, glassy variety, although you may also see some white or milky grains. When quartz of any of these kinds is coated with hematite or iron rust it becomes pink or red. The black grains are made of magnetite—an oxide of iron. The shiny, flaky, lighter-coloured mineral is muscovite or white mica. These very beautiful beaches have resulted from the accumulation of great quantities of almost pure quartz sand and are different from most beaches in that they contain hardly any other minerals. Sands in other places may include fragments of many other kinds of minerals and of fine-grained rocks. The processes that produce sand may be simple or complicated but they all require that a rock be worn away in one place and that the resulting debris be carried off to accumulate somewhere else. If the breakdown of the original rock is by purely physical means, such as splitting by frost or grinding along sea-coasts, the fragments may exactly resemble the rock and mineral grains from which they came. Most rocks, however, are made of a variety of minerals in varying proportions. Some of these minerals may break down chemically when they are exposed to the weather—everyone knows how iron rusts away gradually when it is left  unprotected. Suppose a rock were composed of a mixture of minerals, and some of these minerals were broken down physically and some were altered chemically. One would expect the debris from the erosion of this rock to be a mixture of grains—some looking like the original and some quite different because of the chemical changes. The most common of all minerals in rocks are quartz and feldspar. Quartz is a hard, glassy or white mineral which is very resistant chemically and very tough physically. Feldspar, on the other hand, decays rather readily under ordinary conditions of weathering, even though it is fairly hard. Thus, most rocks that are weathering at the surface of the earth will go to pieces gradually with the breakdown of feldspars and other chemically susceptible minerals and the breaking off of bits of quartz without change. After the original breakdown of the rocks the next stage in the development of sands is the transportation of the materials of weathering. The grains may be swept into a river system or into the waves and currents along shore. Soft grains are worn finer and finer by abrasion, and the more resistant and tougher ones—such as the quartz grains—generally last much longer. If the materials have come a long way then the process of separation will be more complete than if the distance of transport is short. Beaches and bars consisting of highly pure quartz sand would thus indicate that the stuff they are made of has survived a long and rugged history. It is intriguing to think that we may be looking at the graveyard of a chain of mountains as we scan the wave-swept beaches. Ripple marks formed by the rhythmic motion of water in waves are symmetrical. These ripples have been rounded off on their crests as the water retreated. Patches of pebbles interfere with the regularity of the rippling. Some erosion of the ridges has taken place just below the shell. It very commonly happens that beach and delta deposits of sand become hardened into solid rock. If this rock eventually becomes exposed to erosion again the same grains of sand may be loosened out of the second rock and washed back and forth again by waves or currents. It is almost safe to say that most beaches with nearly pure quartz sands are of this kind. In Prince Edward Island National Park the reddish sandstone and siltstone of the underlying bedrock have contributed much of the sand. It is probable that the sands on the bottom farther out under the sea have also come from the breakdown of similar rocks. This means that the sand grains were blowing about or were being carried by water in motion in the seas and rivers of 250 million years ago, that they then became part of the solid rock, and then were torn loose and washed about all over again. Now pick up a handful of this ordinary sand and scan the grains with this long and complicated history in mind. No matter how small a wave is as it sweeps in on a sandy shore, it disturbs and rearranges some of the sand grains. Light grains are moved about more than heavy grains and small ones more than large ones. Once lifted from the bottom and put into temporary suspension in the water, lighter and smaller particles take longer to settle again than heavier and larger particles. This holds true no matter what the cause of disturbance or how powerful it is. You can actually observe this differential agitation by going down to the shore and wading out to a place where the water is about 8 inches deep with gentle waves coming in. As each wave passes you may see through the clear water how the sand is stirred up and how it settles out. Some grains settle out at once, but others take a few seconds longer. The very fine particles of mud and clay have long since been carried off, but if they were still here they would probably stay suspended for a long time so that the water would appear muddy even from a distance. 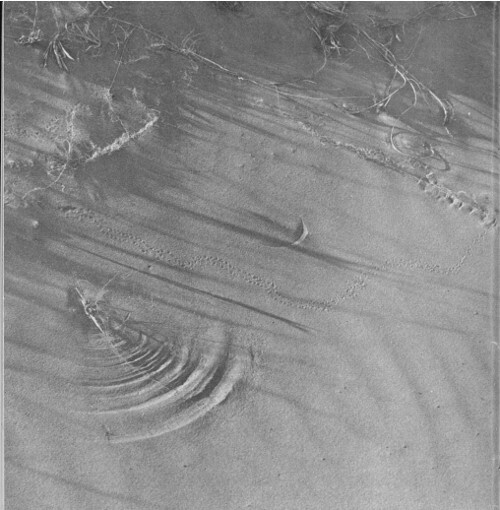 Currents formed along the shore or due to the return waters of breaking waves produce asymmetrical ripple marks like these. Notice how the larger pebbles and grains are more conspicuous in the hollows and the finer grains are in the crests. A snail’s track is clearly visible leading from one end of the jack-knife along the flank of one of the ripples just below its crest. The large pebble above the knife has interfered with the ripple pattern. When water is in motion over loose sand the surface of the sand is formed into ripples. These structures you may see along any of the beaches of the Island. They are present in the beds of small brooks that empty into the sea across the beaches. They can be seen in great abundance on the flats left by the receding tide. They are well developed on the sea bottom to depths as great as 30 feet and more. When you are swimming they may tickle your feet. Ripple marks are of two kinds—symmetrical and asymmetrical. This means that one type is formed of peaks with troughs of exactly the same shape on either side, and the other type has peaks with troughs that are not the same on the two sides. It is common to associate the symmetrical ones with waves and the asymmetrical ones with currents; but close observation will show you that waves may cause either kind whereas currents will only cause the asymmetrical ones. When currents become very swift they produce the whirly-patterned ripples seen in Figure 6. The shapes of ordinary ripples, in which the ribbing is at a right angle to the flow, are changed to this whirly pattern when thin sheets of water, such as in a shallow brook, flow swiftly over a muddy or sandy bottom. In small streams crossing the beaches in Prince Edward Island National Park, such as the one on Cavendish Beach, these ripples are visible in all their rapidly changing shapes. Whether waves produce asymmetrical or symmetrical ripples depends entirely on how they are breaking and the shape of the bottom. In some instances you can stand with the gentle waves lapping about your feet and watch symmetrical ripples change to asymmetrical ones in a fraction of a second as the wave changes shape during its exhaustion on the shore. Symmetrical ripples are more common in deep water; in shallow water the sharp forward motion of the wave is counterbalanced by a more gentle but longer-lasting backwash current. The exact depth at which the change from one to the other occurs depends on the shape and size of the waves. The constant disturbance and rewashing of the sands—the action that forms the ripples—also tends to separate minerals of the sand. You may see this by examining closely some well-formed ripples. Black grains of magnetite are commonly much more abundant near the crest of the ripple than in the trough. Coarser particles, bits of shells, and pebbles may be left in the troughs. Light fragments are found in greater concentration on the front of the steep face of the ripple than anywhere else. In the gentle waves of the shallow water you can watch this process of separation actually working. As the tide recedes the ripple marks found on the bottom come closer and closer to the surface. They thus become more and more liable to erosion by currents as the shapes of the waves change and as the rhythmical wave motion changes to a series of currents. As the ripples come to the surface their tops are planed off and their troughs become filled. Most ripple marks are completely obliterated by the time the tide has left the former bottom dry. Up and down the beaches of Prince Edward Island National Park you will notice large areas of beautifully rippled sands. How were they preserved? There are three ways. The first has to do with the slight shallowing of the water offshore which you may notice as you wade out for a swim. In such an area, ripples may be formed all over the bottom during a time of high water. As the tide goes out, the waves breaking on the receding shoreline may destroy the ripples as they come close to the surface of the water. On the other hand one of the offshore bars may cut off the waves as the water gradually goes down so that the ripples are preserved in a pool of quiet water behind it. As the tide goes out still more, the water in the pool may drain off to the side or sink through the porous sand and leave the ripples completely exposed. Sometimes breezes on the surface of the pool stir up small waves which in turn start new ripples on the bottom. These may be superimposed on the ripples developed earlier and make complex patterns, as shown in Figure 7. An almost endless variety of patterns of ripples is formed along the Prince Edward Island beaches as changing waves and currents superimpose patterns on patterns. In this area, asymmetrical current ripples were formed by waves moving to the left. As the tide went down the wind blew up small waves which started to form ripples with their main motion towards the observer. Another way that ripples are preserved is related to periods of waves and calm. Suppose waves are piling ashore during a stormy period and ripple the bottom sands. If the weather changes suddenly and a complete calm follows, the tide may leave well-preserved ripple marks on the exposed flats because there are no waves to destroy them. It commonly happens that ripples are preserved over large areas if the bottom slopes downward from the beach to a flat area which is above low-tide level. In this case the waves are prevented from destroying the ripple marks that were formed when the water was deeper. The waves cannot sweep across the shallow water on the flat with enough force to disturb the bottom; instead, they break on the outer edge. As the tide continues to recede the water drains off the rippled area and leaves it exposed. Ripple marks are best developed on beaches and bottoms that are covered with clear sand. Pebbles and bits of shells scattered among the grains of sand interfere with the formation of ripple marks. In Figure 5 a pebble clearly has altered the pattern of the rippling, not only close by but also farther along in the down-current direction. With symmetrical wave-rippling, the influence of such foreign bodies is not felt as far away as it is in current-rippling. If rippling in one direction is followed by rippling from another direction the patterns produced by the first interfere with the formation of the second. Interference patterns result if the process is stopped before the first set is completely obliterated. They also result when two sets are being formed at the same time. This could happen when a current is setting along the shore in one direction and waves are moving in another. An almost endless variety of combinations of ripples and patterns comes from conditions like this. Pebbles and shells rest in small depressions eroded in the sand by moving water. The delicate white lines are swash marks—tiny ridges of quartz grains, mica flakes, bits of shell and organic matter that mark the farthest line of penetration of individual waves. 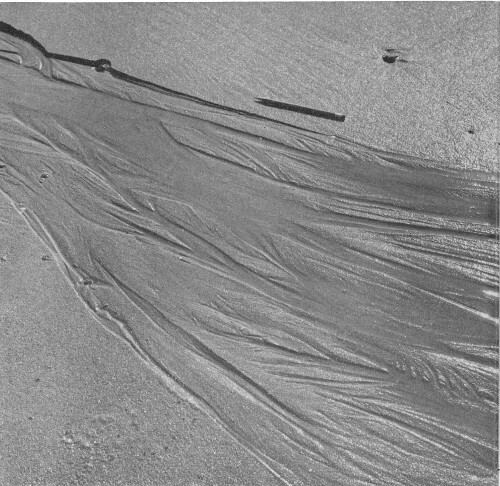 Rill marks are made on beaches when water oozes out of the saturated sand at low tide and returns to the sea, or by leakage from pools behind bars of sand. Notice the patterns produced by the shifting channels. The pencil gives the scale. Geologists have discovered rippled surfaces on sandstones in many places. These were laid down in ancient seas as much as a billion years ago, indicating that the processes we have seen on today’s shores have been going on for a very long time indeed. Where waves wash onto sandy shores they often leave delicate little lines of debris at their farthest shoreward penetration. These are called swash marks and are very well shown on many of the sandy beaches of Prince Edward Island National Park. If you go down to the water’s edge and watch closely you may see how they are made. As the water from the last forward motion of the wave washes up the gently inclined surface of the sand it carries a load of tiny particles on its leading edge. When the forward motion of the water finally stops, some of the water sinks into the sand and some of it runs back down the slope. Whatever it was carrying on its leading edge is left stranded as a swash mark. On some of the Island’s beaches, swash marks are made of grains of white mica, glassy and milky quartz, bits  of mussel and clam shells and other light fractions of the beach material. These swash marks appear as light lines on the darker beach sand as in Figure 8. In other places the swash marks are made up of almost exactly the same materials as the rest of the beach, so they appear only as minute ridges of sand. Each wave covers a slightly different area from the ones before, so that the swash marks appear as overlapping patterns with only the last one complete. When the tide is rising one would expect the swash marks to be erased gradually and replaced by later ones higher up the beach. But when the tide is receding, waves would reach less and less far up the beach, so that the area of swash-marked sand would gradually widen. One would hardly expect such delicate structures to be preserved when sands are solidified into rock, but geologists occasionally turn up ancient rock surfaces with swash marks clearly shown. When the tide comes in, water fills the pores in the beach sand up to the high-tide mark. As the tide goes down some of this water may leak out of the pore spaces and run back down the slope to the sea again. The marks made by such returning water, or by water that comes into the sand as rain or as seepage from ponds or lagoons at the back of the beach, are called rill marks. They are often branched with plant-like patterns as in Figure 9. 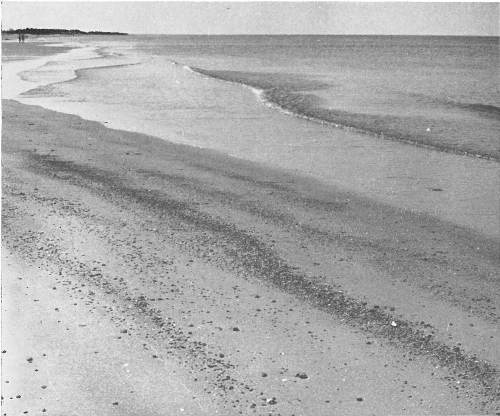 When waves break onto shallow, shelving, sandy beaches the water moves forward to its maximum penetration, then reverses direction and flows back down again. As it gathers speed down the slope it forms patterns like these, above and around pebbles. The sand may be seen in motion as the water swiftly erodes a little hole behind each pebble and makes V-shaped patterns outward from them. 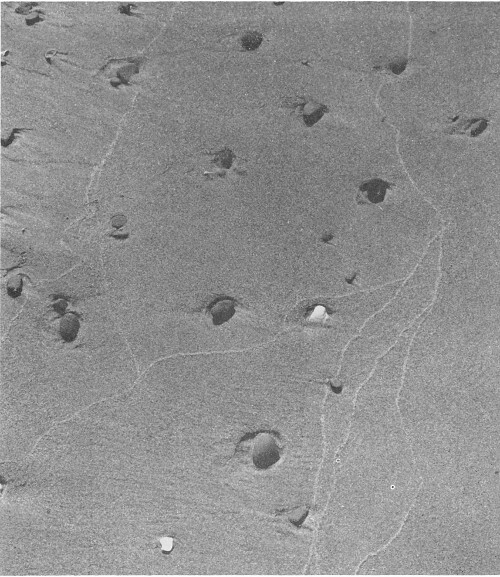 When the receding waves are gone the sand may be patterned like this, with the pebbles lying in their eroded depressions and the V’s clearly showing beyond them. As waves sweep in on beaches they tend to flatten the sand into smooth surfaces. If pebbles or rocks occur on the surface the flattening process is interfered with. This is because the return part of the  wave is in the form of a swift current running down the beach. As the current of water is forced around a boulder or a pebble its velocity is increased immediately adjacent to this obstacle, so that it tends to scour the sand from around it. 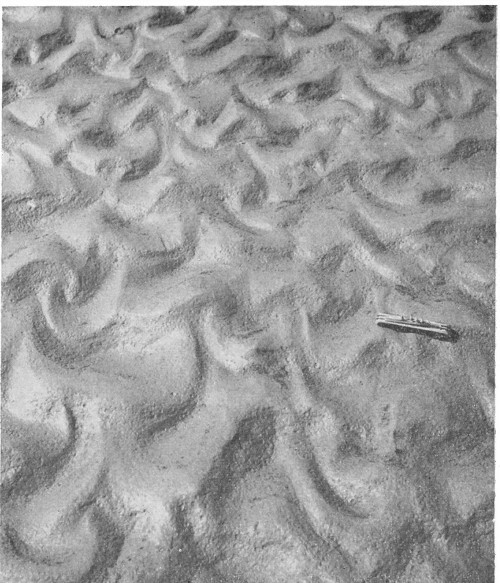 The resulting mixture of sand and water moves down-current where the sand drops out and settles on the bottom in a V-pattern, nicely shown in Figures 10 and 11. Sometimes several collinear V’s are formed by the currents, and any variety of compound patterns may result when several such simple patterns interfere with one another. Under certain conditions the patterns may be different. Behind each pebble a small area is protected from the moving water and is left as a little ridge. The V-patterns do not affect the immediate bottom but occur some distance farther back where they may appear without the pebble being actually part of the V itself. Streaming out behind the protecting pebbles are long trails of sand grains that are a little different from the surroundings. This condition is partly responsible for the complicated pattern in Figure 12. Wiggly lines, curved lines, branching lines and straight lines—marks of slow-moving snails and other bottom creatures—are common on soft sedimentary materials. The track along the crest of the ripple in Figure 5 was made by a snail. Tracks of wading birds and seagulls are often found on the beach and add their stories to the many others imprinted on the muds and sands there. Here is a complicated pattern on the beach which has been compounded of interfering ripple patterns and the erosion patterns of retreating wave-water around pebbles and shells. High, peaked hills of sand, partly covered with coarse grass, lie behind the beaches all along the shore zone of Prince Edward Island National Park. They are made of wind-blown sand and can properly be called sand dunes. One may not ordinarily associate the north shore of the Island with a desert, yet in the small areas just above the high-water mark the landscape is similar in many respects to some parts of the world’s great deserts. Some of the sand formerly carried by waves and currents is picked up and blown about by the wind as soon as it dries out. Storm-waves may pile the sand onto the beach to a level that is higher than usual. When the water level returns to normal the sand above the level of the prevailing high tide quickly dries out and becomes available for transportation by wind. Even in ordinary times some of the sand dries out rapidly enough between high and low tide to be blown about. As the wind first comes up, a few grains of sand move slightly; then as it increases, more grains begin to move and travel longer distances. Finally, when the wind velocity is high, the whole surface of the beach area is covered with sand grains in flight. Each grain is picked up by the rushing air and carried a short distance downwind where it falls to the ground again. Any one grain may repeat this sort of jumping movement again and again. Other grains of sand may roll on the surface for shorter distances. In time of storm, waves carry the sand forward and high up the beach where, during a calm period it may dry out and become susceptible to wind erosion. If the wind is offshore the sand may return to the waves; if the wind is onshore or along the shore the sand may be piled up into dunes and hillocks. These dunes are constantly being augmented by more wind-blown sand, or eroded, although the growth of grass on them may stabilize them for long periods. The movement of sand grains is interrupted by even slight irregularities—like a small hump in the beach, a boulder, or even a large pebble. Once the air currents are disturbed, the moving sand begins to build up either in front of or behind the obstruction, making it an even greater obstacle. When this happens the even flow of air and sand becomes more interrupted and altered. Thus a pile of sand is made. If the wind should blow in one direction for long periods then beautiful crescent-shaped dunes may be formed. 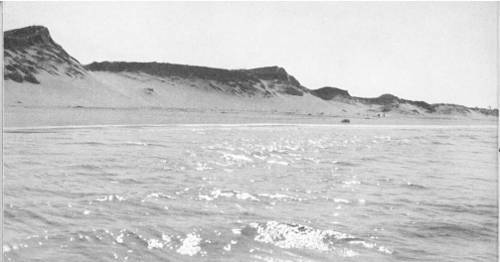 The wind is variable along the beaches of Prince Edward Island but it is generally off the water so that irregular hills of sand are elongated parallel to the length of the beach. Once built, these mounds of sand are constantly altering their shapes. The tough, deep-rooted grasses that grow in such sands tend to stabilize the dunes and prevent rapid drifting of the sand. The grass also tends to collect more sand. When the cover of grass gets broached by scouring winds it exposes the long root systems that hold the sand together. Once a hole in the protective cover is made, the sand may blow out easily and leave a round pit on the sides of which the grass is undermined. These pits are called ‘blowouts’. When the wind is blowing sand along or across the beaches into the dune areas the moving particles commonly move up the slope and fall over the edge into the lee. This process you can see in many places along the National Park beaches, such as on the landward side of the very large dunes or small mounds. 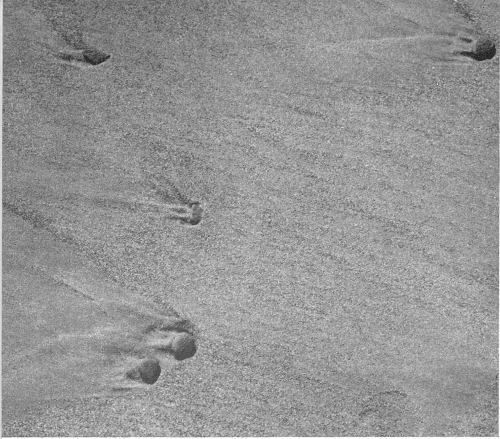 You may see it on a small scale on the ripple marks which cover the surfaces of the dunes. 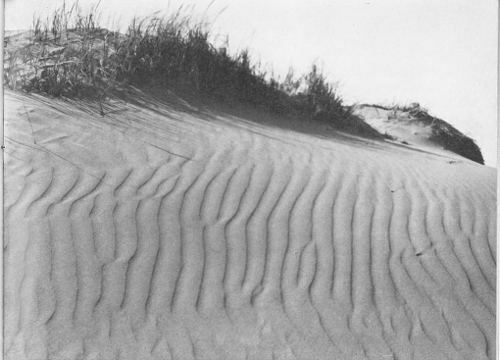 The surfaces of the dunes and other areas covered with loose dry sand are often thrown up into subparallel ridges called ripple marks. 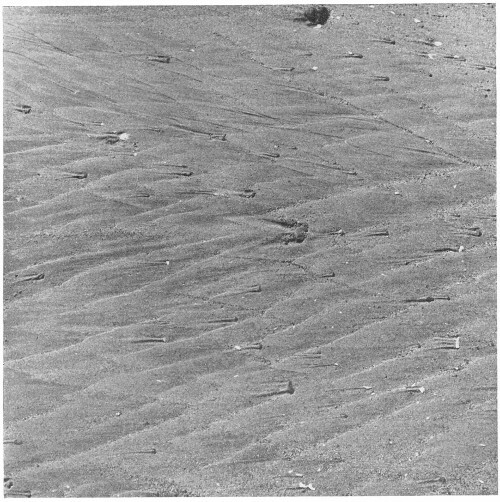 They are similar to the ripple marks found on those sandy bottoms that are subject to water currents, but they have some differences because they are made in dry sand in the air instead of under water. The same  sorting of sand grains into areas of different sizes and areas of different kinds may also be seen. We have already seen how sands of mixed mineral grains of different sizes and different shapes may be sorted by running water or waves. The sorting action of wind is of the same general character, but it is probably more sensitive to differences among the grains. As wind starts to increase in velocity it may eventually get strong enough to pick up light particles. If the sand is made up entirely of one mineral the smallest particles will be carried off and deposited somewhere. If, on the other hand, the sand grains consist of a variety of sizes of a variety of minerals, then the very small particles of heavy minerals and the larger particles of lighter minerals may move off together. Whichever is the case, the process is one of separation of different kinds of particles—taking some away, leaving others behind. The processes of sorting on the beach have already operated when the waves and currents were carrying the sands. Now the wind takes over and further separates the sand according to sizes and kinds of grains. This means usually that wind-blown sands—like those on the Prince Edward Island beaches—are very well sorted indeed. They are, in fact, nearly pure quartz sands, and all the grains are almost exactly the same size. One sample, taken from the large dunes just west of the causeway at Brackley Point, was put through a set of screens with 20, 40, 60, 80 and 100 openings to the inch. All the sand went through the  first and second screens, 17 per cent was caught on the third, 64 per cent on the fourth, and 19 per cent on the fifth; only a trace went through them all. This shows very clearly that the dune sands have a very narrow range of sizes. 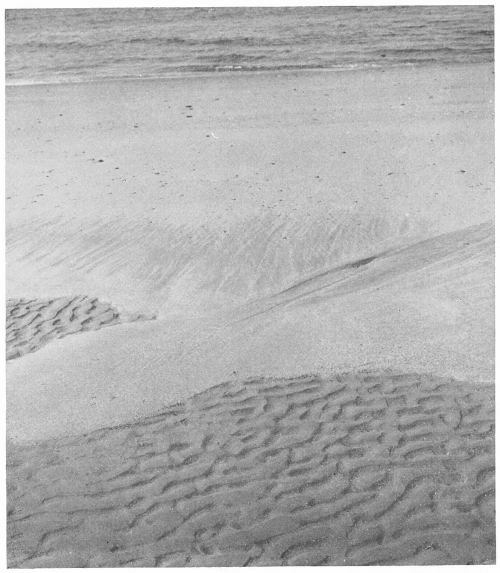 Winds furrow the surface of this dune at Brackley Beach into subparallel ripple marks which are asymmetrical—in cross-section they are longer on one slope than on the other. Clumps of grass hold the sand in some parts of the dune but are inundated with drifting sand or undermined and killed in others. 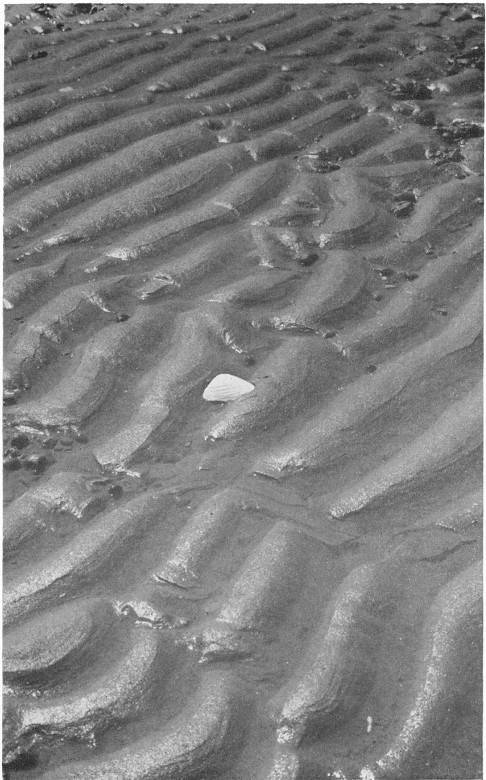 Mineralogical sorting in the sands can be seen on wind-formed ripples. Quite commonly the few grains of  black magnetite in the beach sands are concentrated on the upwind slopes of the individual ripples because grains of the lighter mineral, quartz, are taken away first as the wind erodes the ripples. In some places the black streaking made by this winnowing of the sand along the backs of the ripples is very conspicuous. Number corresponds to locality number on the map. The eastern end of Prince Edward Island National Park comprises long stretches of beautiful sandy beaches backed by dunes in some places and lagoonal pools and ponds. Low banks of reddish sandstone and siltstone alternate with sandbanks and dunes along the beach. A great variety of ripple marks as well as swash and rill marks may be seen on the beaches, and many of the dune surfaces are also rippled. Away to the east the dunes are quite high; some reach nearly 50 feet above sea-level. Most of the sand is made of fragments of quartz. Patches of black sand are formed where the water or the wind has separated grains of magnetite from the rest. Pebbles of reddish sandy siltstone, with occasional khaki or grey ones, are spread along the beach near outcrops of red bedrock. The low pond-areas probably resulted from the building of the beach across the outlets of the ordinary drainage channels. Dalvay House and the main road just east of it are on the margins of one of these  lagoonal pools. The small brooks that drain these pools across the beach are engaged in a struggle to keep open their channels, for the wind is constantly blowing sand across them and the waves are forever smoothing out the shoreline where they empty to the sea. Beautiful displays of rippled sand extend for miles along the beach. In some places the banks facing the beaches consist of sand or glacial till. In others they are made of the red bedrock of Prince Edward Island. Wire matting and nets have been filled with boulders and spread over the face to slow down erosion of the banks where it is too rapid. You may note that the beach here seems a little redder than usual. This is perhaps because the sands, after being eroded from the banks, have not been washed and worn as much by the waves as they have in other places. Pebbles and rare larger fragments of reddish sandy siltstone are common on some parts of the beach and are mostly strung out in lines parallel to the water’s edge. In many of the rippled areas the pebbles and fragments of shells tend to lie in the troughs of the ripples. Black magnetite is clearly visible on the crests of some ripples, with the ordinary quartz sand making up the rest. You will find the best-preserved ripple marks in a wonderful variety of shapes and patterns behind the slight bars that have been built by the waves. When the north shore of Prince Edward Island was  drowned by the sea, shallow river valleys were flooded, making estuaries along what is now the Park. Covehead Bay and Brackley Bay are two of these. A map or an aerial photograph clearly shows the outlines of the old valleys with the brooks still coming into their inland ends. Waves and currents along the shore built up sandy bars across the headlands and across the mouths of the estuaries. They would probably have been completely sealed off long ago if the tidal currents in and out of the estuaries did not keep the openings more or less clear. This bridge is over one inlet that allows the water to circulate in and out of the combined Covehead Bay and Brackley Bay area. As is common in such places there is much shifting of sand back and forth and each storm may produce visible changes in the shape of the shore. Along the back of Brackley Beach the dunes become quite high, some reaching 60 feet. 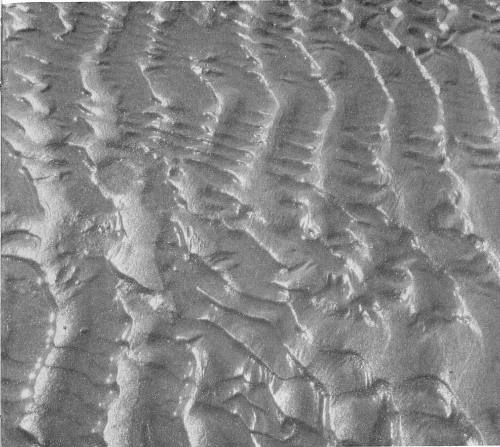 Rippled surfaces are common in all the dune areas, and from place to place subtle differences in the size of the sand grains are caused by the selection and sorting of the sand by the wind. Blowouts are common in the grassed areas of the dunes and show how the wind is constantly remodeling the landscape. Brackley Beach displays wave- and current-ripple marks in great variety. Here is another opening in the string of barrier bars and beaches that have been built by the waves across the  irregular line of the flooded north shore. It is similar in most respects to the Covehead Harbour inlet and it is kept open by the same processes. The building of the causeway has undoubtedly changed the natural shifting of the sands in the tidal currents. This is an island link in the chain of barriers, bars and beaches that the waves and the shore currents have built across the headlands and inlets of the irregular shore of Prince Edward Island. Some of the sand has been eroded by waves from the shallow bottom offshore and has been carried in to be deposited along the shoreline. Some has been swept along the shore by currents and left for the waves to build it up along the beaches. When some of the sand dried out the wind picked it up and built dunes out of it. The estuaries back of Rustico Island and the nearby points are perfect examples of flooded river valleys and clearly show the main valleys with their tributaries now filled with sea-water. The beach at the east end of this section of the Park extends from the mouth of Rustico Harbour northwest for about three quarters of a mile, where it ends against a point of red rock. A walk around the point under the low cliffs will show you an entirely different set of shore conditions from those along the beaches, for here the bedrock meets the sea directly. The profile from the tops of the cliffs to the sea has three parts. On the top the grass and occasional low bushes  are rooted in dark, reddish or brown-red soils a few inches deep. These soils have come from partial decay of the material underneath, with the addition of organic matter from vegetation which has grown on them. The soil is succeeded by glacial deposits—an irregular mixture of clay, sand, pebbles and boulders scraped from the surrounding countryside when it was entirely covered by a great ice-cap. This glacial till varies from a few inches to as much as 20 feet thick in this neighborhood. Its boundary with the soil on top is gradational but its boundary with the bedrock below is usually very sharp. At this locality the upper part of the bedrock is made of siltstone with some sandstone. Parts of it are cross-bedded—that is, layered in detail at an angle across the main trend of the beds, which are nearly horizontal. Under the siltstone lie heavy, massive, micaceous sandstone beds. As these resist erosion more than the siltstones, they stand out as a flat terrace in some places. 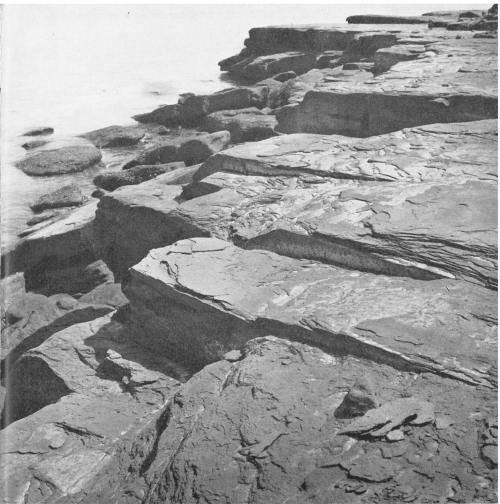 Figure 1 shows the top of this sandstone unit with its jointing and layering, and how it breaks off in angular boulders that form much of the actual shoreline. One may note that some of the bedding or layering surfaces of these sedimentary rocks are ripple marked and carry some trails—structures exactly the same as those formed on the beaches today. It is intriguing to think that at this spot the whole cycle of geological change is repeating itself. The sandy, red rock with its rippled surfaces and its grains of cemented sedimentary materials, formed 250 million years ago, is being  torn away. The sand coming from it is being moved along the beach area, and then is being formed into rippled deposits again. No finer example could be found of one of the basic laws for understanding the geological record—that the processes we see around us now are the same processes that affected the surface of the earth all down through time. The same red siltstone and sandstone units that we described in some detail at North Rustico form the cliffs along the shore from near North Rustico to the east end of Cavendish Bay. At Orby Head and nearby the cliffs are 50 to 100 feet high. A little way west of Orby Head a small brook crosses the beach and wages a constant battle with the waves to keep open its outlet to the sea. When storms increase the power of the waves they are able to seal off the brook by building up the sandbars across it. In calmer times the brook fills up the space behind the bar, spills over and cuts a new outlet which may or may not be in exactly the same place along the bar as the old one was. The beach at Cavendish ends against the rocks at its eastern end. Just east of this, wave-erosion has sculptured the rocks into a variety of shallow caves and overhanging cliffs, and has bored holes right through a small point there. A small cove nearby has a pebbly beach that is unique in Prince Edward Island National Park in that the pebbles are made of red sandstone, white quartz, and agate mixed with fragments of white clam shells and blue mussel shells. The rock fragments are all well rounded, which shows they have been transported in running water for some distance. They may have come from a conglomerate layer in the bedrock nearby or perhaps from the glacial debris. 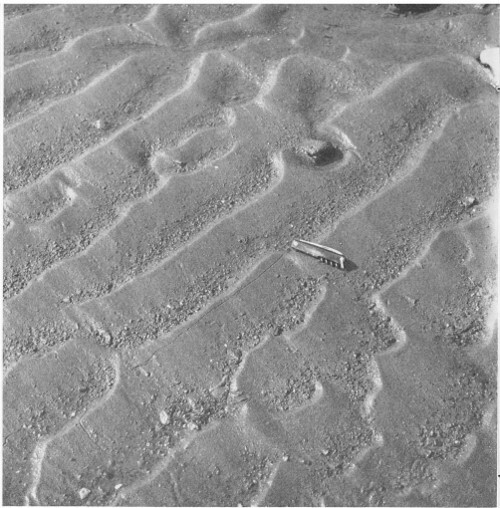 Modified ripple marks in the foreground were preserved from complete obliteration by the slight ridge of sand just beyond them. Waves have washed over the ridge to produce the marks on the back of the ridge; in one place the waves have formed a small delta which covers the rippled area. Erosion of the shoreline rocks has produced a stack or remnant just off the end of the point about half a mile east of the end of Cavendish Beach. 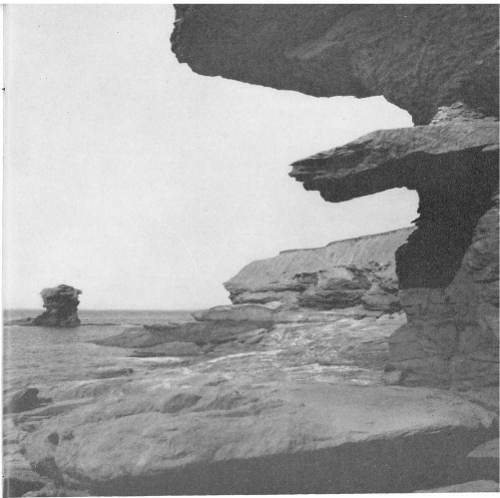 The nearby cliffs and the stack itself are shown in Figure 3. The beautiful sands of Cavendish Beach stretch away to the west from the end of the rocks which are about opposite the end of Route 13 as it comes from the south. Wave-washed beaches give way landward to a wide neutral zone with irregular dunes rising behind it. The western end of the beach is the end of the bar across the east side of New London Bay. A great array of ripple patterns on the sand, rill marks, swash marks and wind features is spread out along the beach. Lagoonal ponds, made by the damming of the drainage by the drifting sand, occur at the Cavendish end of the beach. Crossing the dune zone in a low area and entering the sea across the wide beach is a brook that drains the Cavendish area and the lagoonal ponds. The position of its mouth is constantly changing as the waves and currents build up and tear down the slight beach ridges there. 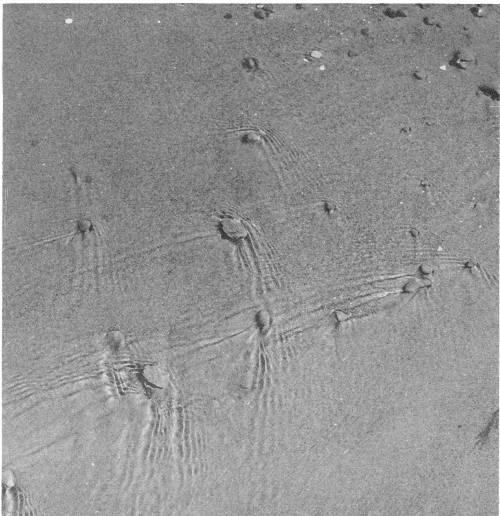 In part of its course across the beach the swiftly flowing water of the brook makes an unusual pattern on its bed, like that shown in Figure 6. Here, on a small scale, the processes of erosion and deposition are so fast that you can actually see the pattern change as you stand and watch. Many stories are written on the surfaces of the dunes. Here, fragments of grass roots blow back and forth and leave unusual patterns. Faint rippling of the sand shows where wind has left its mark. Footprints of tiny creatures weave across the picture among the shadows of the grass. The long spit forming the western end of Cavendish Beach shows many patterns from the air which are not visible from the ground. The back side of the spit is scalloped because during great storms the waves wash through and over it in some places to spew sand into the calm water beyond in fan-shaped deltas. On the seaward side, the aerial observer may see a rhythmic pattern in the shallow, offshore bar; in deeper water farther out, he may see still other bars which are more or less even and parallel to the shore. As you wade out from shore you may become aware of these ups and downs in the sea bottom where the water apparently shallows and deepens. These shapes are due to peculiarities of wave motion, the currents they set up, and the way in which this movement affects the bottom sands—a relationship which is not entirely understood. Prince Edward Island National Park features magnificent sandy beaches along the north shore of a beautiful pastoral land. On and near the beaches are written stories of many events and processes of geological interest. The wonderful array of rippled surfaces exposed at low tide and continued on the bottom beyond the waveline tells of waves and currents in endless patterns. The dunes behind the beaches show us how the wind has heaped dry sand when the waves are done with it. The sameness of the grain size and the  prevalence of the mineral quartz tell of sorting and separation processes down through the ages. The grains of sand themselves tell us of a long history of erosion of ancient mountains, the entombment of their wreckage in the reddish sandstones now seen in some places in the Park, and then of erosion again. The banks of glacial debris tell us of the great white blanket of moving ice which scraped over the area not so long ago. The indented shorelines tell us of old river valleys flooded by the sea, and the bars and spits along the ocean front tell us of coastal currents and wearing by waves. These processes never stop, for as you stand on the edge of the bank at Dalvay or Cavendish, at Rustico or Brackley, waves are still rippling over the bottom, coastal currents are moving tiny grains of sand across the mouths of estuaries and along beaches, sand grains are falling out of the cliffs of seemingly solid rock, and even the lightest of breezes stirs a few sand grains. In winter, when summer beaches seem far away, you can visualize the great storms that lash the coast and cause more changes in a few minutes than are made in many days of gentle summer.